Sell. Free Appraisal for Your Pyotr Ilyich Tchaikovsky Autograph. FREE APPRAISAL. To auction, buy or sell a Pyotr Ilyich Tchaikovsky autograph or a Pyotr Ilyich Tchaikovsky autograph letter signed, please contact NateDSanders.com at (310) 440-2982 or Nate@NateDSanders.com. Undated Pyotr Ilyich Tchaikovsky autograph letter signed on the composer’s personal monogrammed stationery. He writes in Russian to Katerina Ivanovna, a close friend who married fellow musician and Tchaikovsky’s lifelong friend, Herman Laroche. Letter reads in part, “…Give me sweetheart forty rubles as a loan. I don’t have enough to pay for everything…” He adds that he will repay the loan through his friend Manya. Tchaikovsky, famous for his symphonies, operas and ballets, such as “Nutcracker Suite” and “Swan Lake,” was successful in his lifetime, but did suffer periods of financial turmoil. 3.75″ x 5.5″ letter is matted and framed with an image of the composer and a plaque with biographical information to an overall size of 18.5″ x 21.5″. Near fine condition. Sold for $6,534. 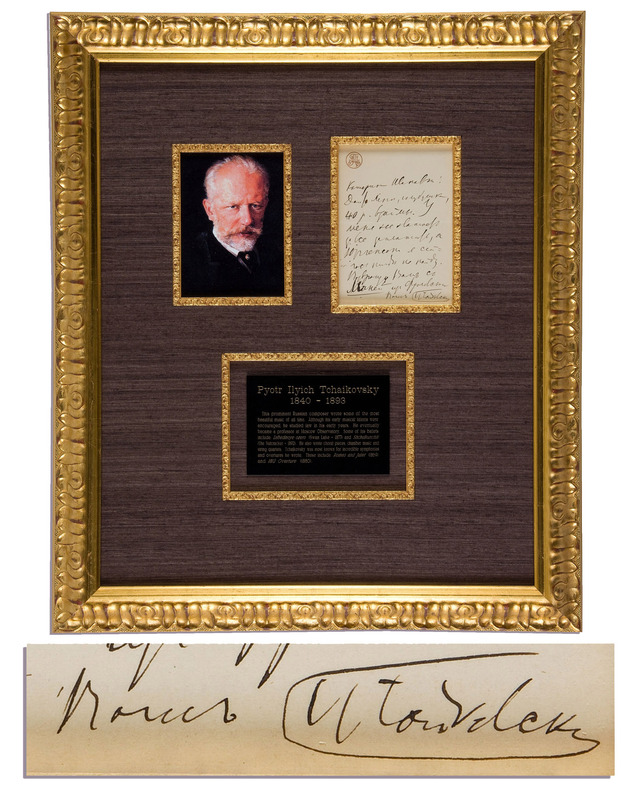 To auction, buy or sell a Pyotr Ilyich Tchaikovsky autograph or a Pyotr Ilyich Tchaikovsky autograph letter signed, please contact NateDSanders.com at (310) 440-2982 or Nate@NateDSanders.com.